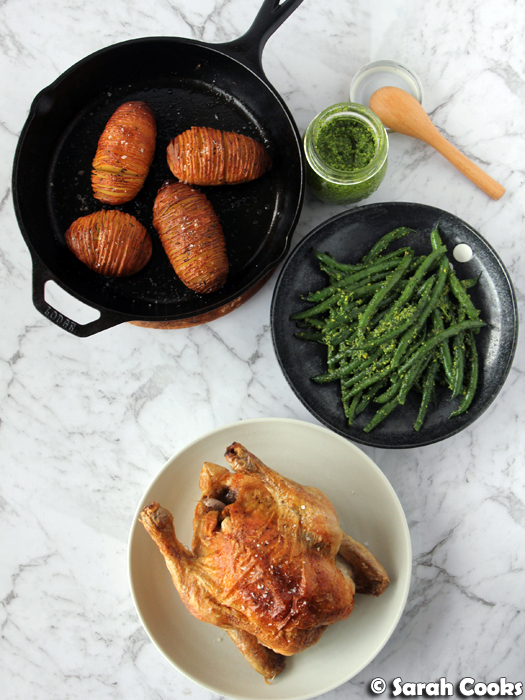 Starting the year off with a super-chill Meal Prep Monday - roast chicken, hasselback potatoes, and green beans with kale pesto. Winner winner chicken dinner! Happy new year! I hope you've all had a lovely new year! I'm excited to be back with a nice new Meal Prep Monday for you! Given how much I've been eating and drinking over the festive season, I basically just want to inhale vegetables for the next couple of months. I have lots of ideas for different salads and vegetable-based dishes to get myself back into healthy eating, but I didn't want to start off too strict and set myself up for failure. I wanted to start the year with something a little less intense, with less pressure. The inspiration for this meal prep started with a beautiful bunch of organic cavolo nero that I saw at the market. How gorgeous! I used some of the bunch to make a jar of kale pesto (adapted slightly from Pinch of Yum, and I stand by my previous comments that her blender sauces are fantastic!) So into the blender with the cavolo nero leaves went some parsley, garlic, pistachios, lemon juice, olive oil, salt and pepper. I love how vibrantly green it is. Yes, it's a really flavourful sauce, but it's also mainly vegetable! I used a couple of tablespoons of this to dress some cooked green beans (my favourite way to eat green beans), and kept the rest for leftovers throughout the week. 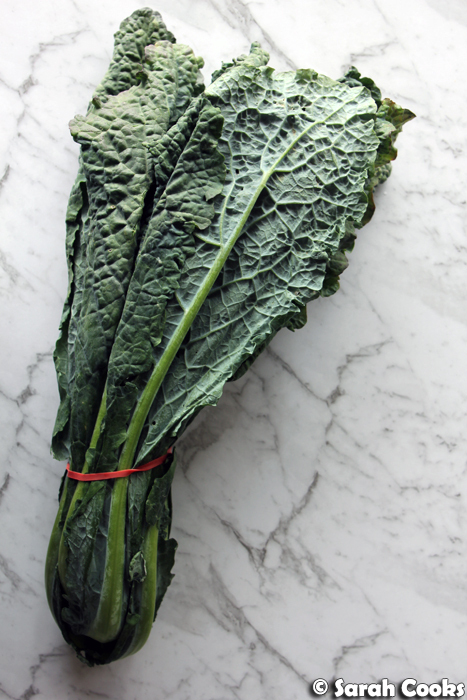 I also had some extra cavolo nero leaves left, which made great leftovers too. But before we get to the leftovers, let's look at the rest of the meal itself! I roasted a small chicken - I just put some lemon, garlic and herbs into the cavity, drizzled it with olive oil, salt and pepper, and roasted it at 200C for 20 per 500 grams + 30 minutes. Easy! Because I was cooking just for myself and didn't need a huge amount, I splashed out on a small organic chicken - it was about one and a half kilos and was soooo flavourful! I had great plans to make stock out of the bones but I got really busy throughout the week, so I've packed them up in the freezer for a future soup. Waste not, want not! Oh, another good idea for leftovers is to use the pan juices to dress pasta, à la Nigella's pasta with butter and stock cube juices from How to Eat. I didn't do it this time, but I've done it before, and it's great. 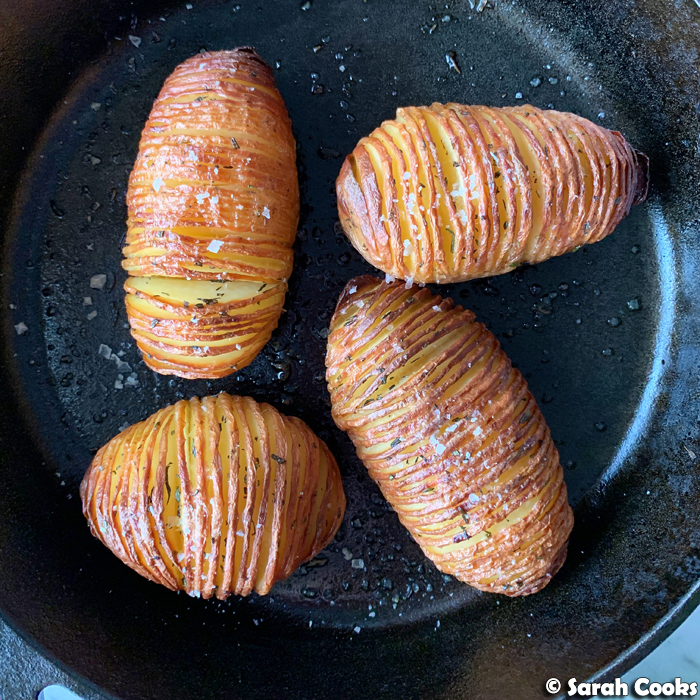 So for a side I decided on hasselback potatoes, mainly because I'd seen them on Laura's Instagram earlier that day and I really wanted them! I didn't follow a proper recipe, but just winged it. I've seen lots of tips saying you should slice them with chopsticks or wooden spoons on either side to prevent you from cutting all the way through, but that seemed like a lot of effort, so I just went freestyle with a sharp knife and did it slowly and carefully. Then I crisped up the outside in a cast iron pan using olive oil (and a little goosefat becuase I happened to have some), before roasting them in the oven under the chicken until cooked through and a little crisp. I sprinkled them generously with sea salt and chopped rosemary (I had a few sprigs leftover from making the chicken). I thought they looked so nice! And that was the meal! Pesto beans, crisp potatoes, roast chicken, plus some extra pesto to use as a sauce. This meal prep set me up really nicely for the week. I had one portion as dinner on Sunday, then packed up three more portions for weekday lunches. I enjoyed having a small roast meal for lunches, it felt nice having a proper meal. I hope you enjoy this meal prep as much as I did! Preheat the oven to 200C. Place a whole chicken into a baking tray. Place 2 cloves of garlic, 1/4 lemon, and a few sprigs thyme and / or rosemary into the cavity of the chicken. Drizzle the chicken with olive oil, salt and pepper. Roast for 20 minutes per 500 grams + 30 minutes. Remove from the oven and allow to rest for 30 minutes before cutting into quarters to serve. Preheat the oven to 200C. Wash 4 medium desiree potatoes. 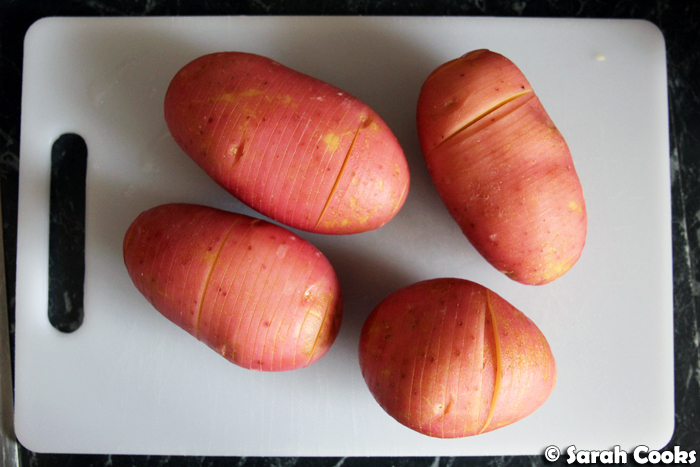 Make slices into the potatoes, approximately 3/4 of the way through the potato, as thinly as you can manage. (Don't cut all the way through, you want to keep the slices connected). 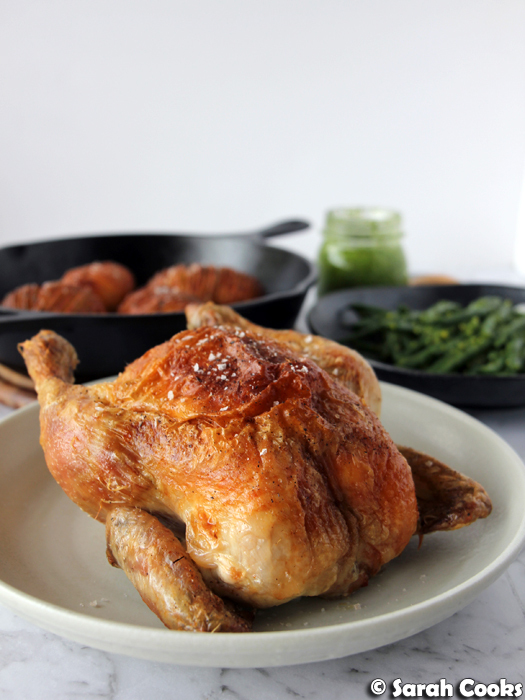 Heat some olive oil, duckfat or goosefat in a frying pan that can go in the oven. Fry the potatoes on all sides until starting to colour. Transfer the pan to the oven and cook for 45 minutes to an hour, or until the potatoes are soft all the way through and the slices are golden brown. Sprinkle generously with sea salt and finely chopped rosemary to serve. 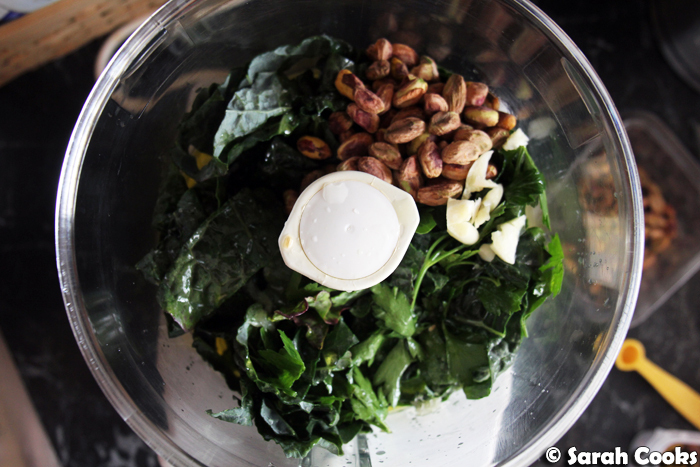 In a food processor, place 1 cup roughly chopped cavolo nero leaves, 1 cup flat-leaf parsley, 1/2 cup extra virgin olive oil, 1/4 teaspoon sea salt flakes, the juice of half a lemon, and 1/4 cup shelled pistachios. Blend until smooth. Taste and adjust seasoning to your liking. Add up to 1/4 cup more pistachios if you prefer a thicker consistency. 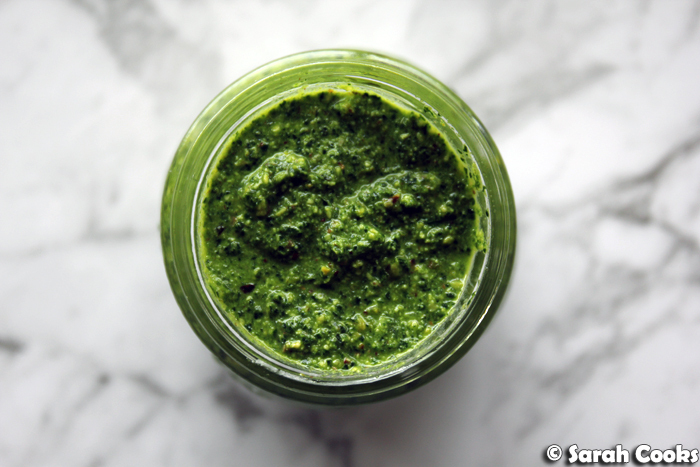 Use 2 tablespoons for the kale pesto green beans, and keep the rest in a clean jar for up to a week. Top and tail 375 grams green beans. Cook in boiling salted water for 4-5 minutes or until soft. Drain and rinse under cold water to arrest the cooking process. Place into a bowl, add 2 generous tablespoons kale pesto, and gently toss with tongs until the beans are coated in the pesto. To assemble the lunches, cut the chicken into quarters and divide the chicken, potatoes and green beans between four serving containers. You're done! Let's look at the leftovers! 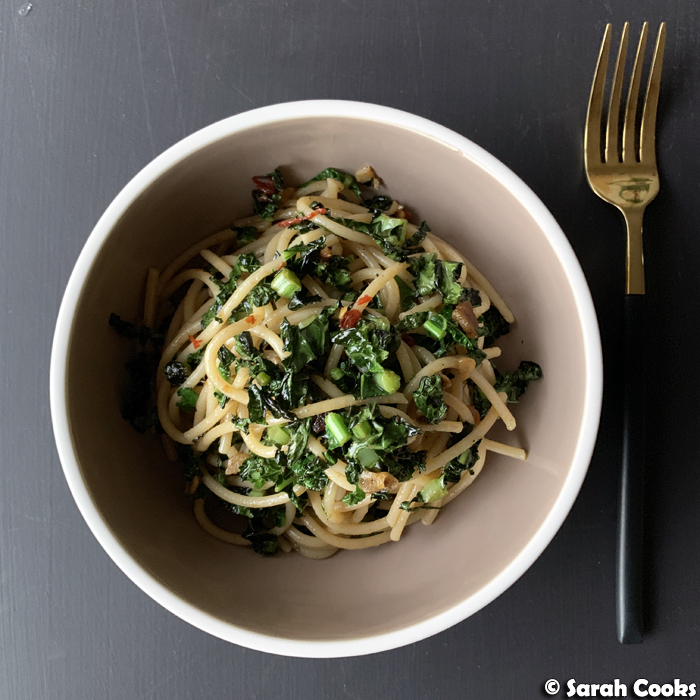 One thing I liked about this meal prep was having a decent (but not overwhelming) amount of pesto and cavolo nero leaves in the fridge to keep me going throughout the week. As I mentioned before, I packed the chicken carcass away and froze it for a future soup, and another great option would be to use the chicken pan juices as a pasta sauce. I used the pesto on toast, adding extra flavour (and green vegetables) to my breakfasts! 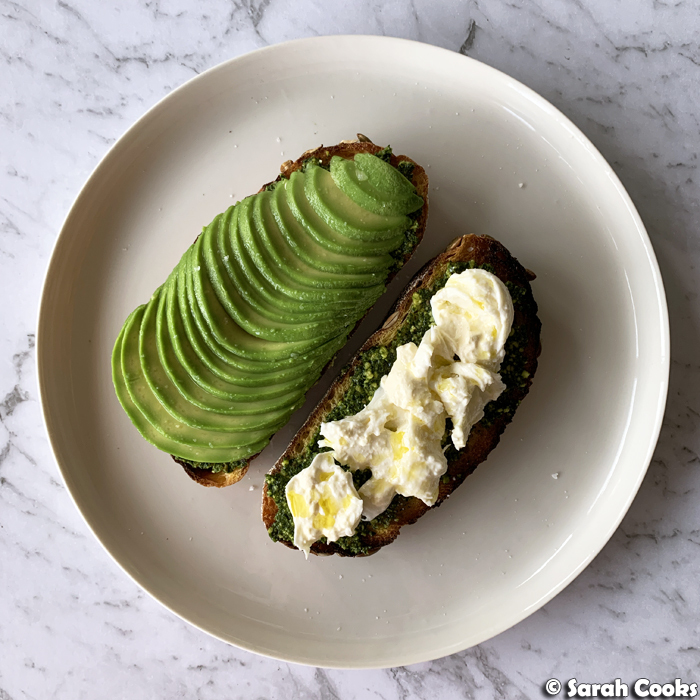 Here my usual (already luxe) avocado toast was made extra luxe with the addition of the kale pesto and a small ball of burrata. (PS I'd treated myself to some burrata at the market when I'd done my shop for the chicken dinner). 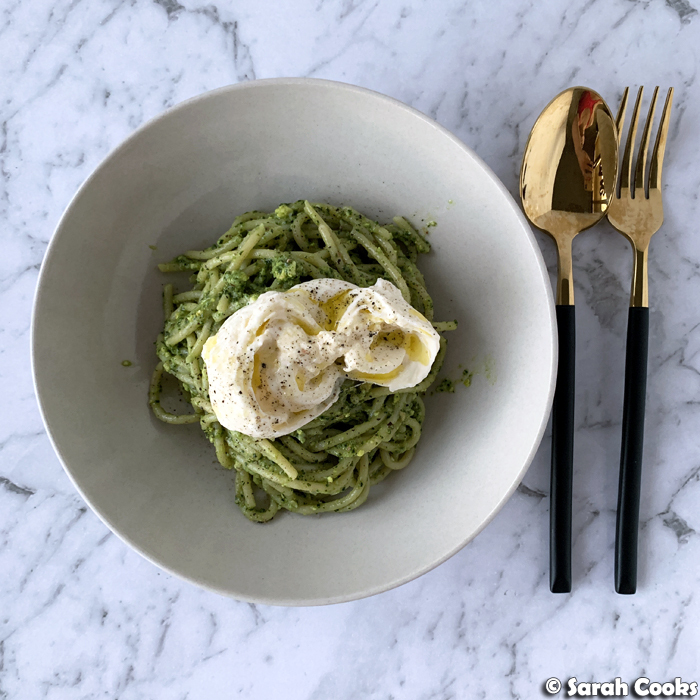 I also used the pesto as a spaghetti sauce, topped with another small ball of burrata. If it looks like a lot of cheese for that amount of spaghetti, that's because it is! Go hard or go home. Another night, another spaghetti. I sautéed some garlic, anchovies, and fresh chilli in some olive oil, then added a few finely chopped cavolo nero leaves and cooked until softened. I tossed some spaghetti through it (and after taking this photo, showered it in grated parmesan). Strongly flavoured and delicious! 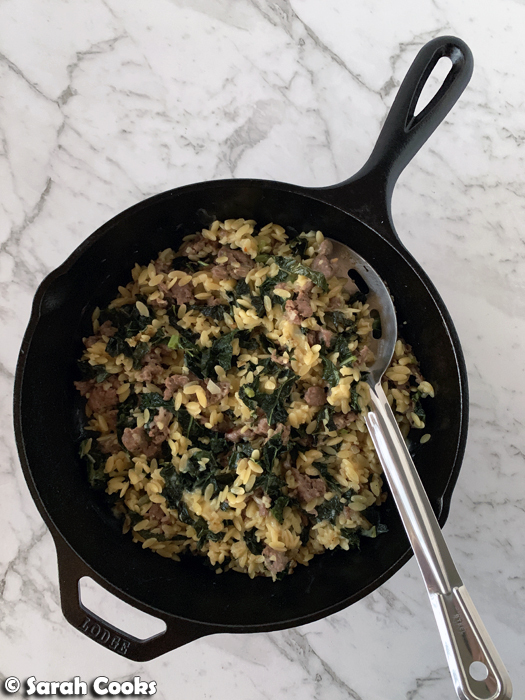 And finally, I made something a little more involved with the last of the cavolo nero - a one pot lamb sausage and cavolo nero orzo dish. This was so good, really comforting but not too heavy, and packed full of flavour! I'll be sharing the recipe shortly! All the best for a fabulous year ahead full of delicious food! I like the idea of easing into things. Can't wait to read about all the things that you bought and ate while you were overseas! 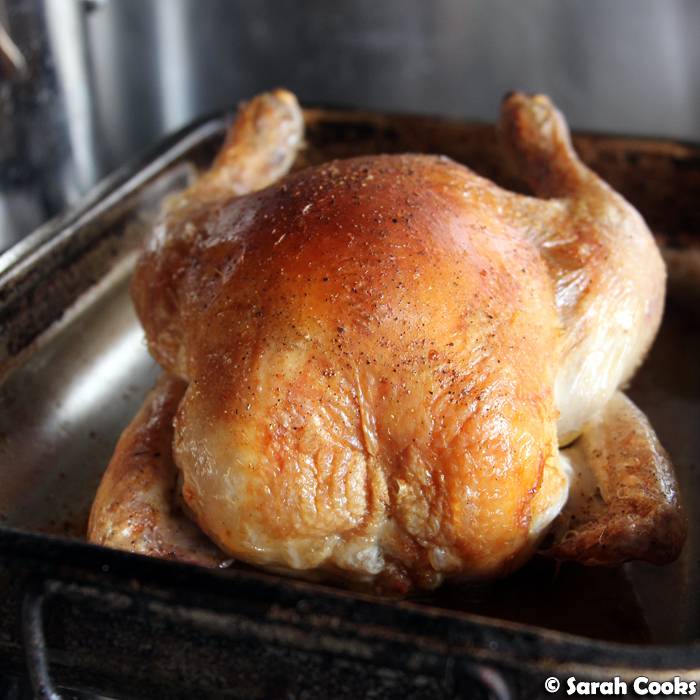 So a tip for roast chicken: cook it breast side down for the first 45 minutes or so, then breast side up for the rest of the time. The skin should still crisp up but it keeps the breast a lot more moist. Great idea! Will try next time.